The report below originates from Ariete’s files held at NARA. It is the official after action report from the command of Ariete’s 132nd Tank Regiment, and covers the actions of the Colonna di Nisio (see an overview of its organisation also at this link) during the battle of Totensonntag, November 23, 1941, when it operated with the D.A.K. to destroy 5 South African Brigade and the remainder of the Allied forces on the Sidi Rezegh air field. It is probably the only source other than the war diary that quantifies the losses in tanks that Ariete suffered on the day. I have written up the war diary at this link. On higher orders, under the command of Brigadier General di Nisio, Deputy Commander of the Ariete Division, an armour-mechanised column was formed, consisting of two companies of the 8th Tank Battalion and two of the 9th Tank Battalion, one group of 75/27 [guns], one light detachment of portee trucks with 65mm guns, two battalions of Bersaglieri, and two (?) sections of 20mm guns. Its task was to move into the area Bir bu Cremisa, to work with the German forces coming from Gambut. At 08.30 hours, leaving behind in the zone of Bir el Gubi the remainder of the tanks and vehicles, the column, pointing east, moved to reach the target destination. At about 09.50 hours, after only a few kilometres, enemy vehicles coming from the north-east were recognised. The column continued its march with the tanks in the van, and most of the vehicles closing up. The tanks pushed forward decisively, and soon were in contact with the enemy elements, leading to lively engagements which the adversary however managed to extract himself from thanks to the higher speed of his vehicles. – About 10.00 the column has to stop because of signs of violent artillery fire from flying enemy batteries from the centre of resistance. The stop is protracted until 13.00 hours and the tanks, in reaction to the situation, form a defensive front with the 2 companies of the 8th facing north, and the 2 of the 9th facing out. At about 13.40 hours, coming from the north-west, a great dust cloud announces the arrival of a column with a certain strength of numerous vehicles. At 14.00 hours the Italian and German forces make contact, fusing into a block of steel that now points, in straight union, at the enemy forces advised to be in the area. After a brief halt, the German forces move pointing in the direction of Bir bu Cremisa, and the Italian forces remain on their left, with the same objective. At 14.25 hours the Germans close up with the enemy from the north, while our armoured vehicles find themselves embroiled with similar English vehicles. At 16.00 hours the fight shows itself to be violent and decisive. The tanks move on the attack in waves, in combat formation, and sustain the collision with resoluteness, stopping various British vehicles in the area. The light artillery of the C.A.M. is launched on the left flank and in-between the M.13 with the order to support with anti-tank fire the fire of our armoured vehicles. The German forces meanwhile continue their operation to annihilate, with their flank protected by our forces. Intense fire from the field artillery continues amid the clash of tanks while dense high columns of smoke engulf the horizon. Close-knit formations of planes survey the area incessantly in search for opportunities to strafe, but are frustrated by the immediate intervention of the anti-air artillery. At 17.00 hours the struggle does not abate but rather increases in fury and intensity similar to that which happened during the encounter at Bir el Gobi. Regardless, all the tanks proceed orderly with their advance extinguishing the last resistance of the adversary. At 17.30 hours the English waver and rescue the last surviving vehicles, by moving to flee. During this time the daylight diminishes, and the dark gathering on the horizon renders the flames of the fires even more lively. An endless line of similar fires on many places shows the line of retreat of the enemy. German and Italian forces, cooperating closely, now find themselves among the remains of the defeated enemy, as they were during their decisive action of destruction. Also during this action, like the previous one, the tank men have been above any praise. They demonstrated their superb aggressive intent and their sense of unity with their weapon up to making the supreme sacrifice. Against the numerous but unquantifiable losses of the English and an immense number of prisoners stand one dead and four wounded, and two tanks lost (fuori combattimento) and three lightly damaged. Not sure how often this would happen, but today the start of Operation CRUSADER and the day by which the anniversary of its most famous engagement, the second battle of Sidi Rezegh on Totensonntag (Sunday of the Dead), is known, fall on the same day. They originally were on 17 and 23 November 1941, respectively. Below some links from this blog on the battle of Totensonntag 1941. In the initial stage of the Sidi Rezegh battles on 21/22 November 1941, Brigadier Jock Campbell, commanding 7th Support Group, the non-armoured element of 7th Armoured Division, won his Victoria Cross for his brave and energetic leadership of the defense forces on Sidi Rezegh airfield against the German assault. The best online account of the battles I am aware of can be found at this link. Bob Crisp memorably describes the action in ‘Brazen Chariots’, and I think Cyril Joly in ‘Take these Men’ also describes it. When I started my research into the Operation, I came across a very dramatic drawing that encapsulates it very well, and I contacted the National Archives to have it properly identified, which they did very quickly, but unfortunately then changed back to the old text again after a while. Probably too speculative for them. I think it’s a shame, since the drawing would properly belong into their ‘Valour’ colleciton. The KING has been graciously pleased to approve the award of the VICTORIA CROSS to Brigadier (acting) John Charles Campbell, D S O, MC (13594), Royal Horse Artillery, in recognition of most conspicuous gallantry and devotion to duty at Sidi Rezegh on the 21st and 22nd November, 1941. On the 21st November Brigadier Campbell was commanding the troops, including one regiment of tanks, in the area of Sidi Rezegh ridge and the aerodrome His small force holding this important ground was repeatedly attacked by large numbers of tanks and infantry. Wherever the situation was most difficult and the fighting hardest he was to be seen with his forward troops, either on his feet or in his open car In this car he carried out several reconnaissances for counter-attacks by his tanks, whose senior officers had all become casualties early in the day Standing in his car with a blue flag, this officer personally formed up tanks under close and intense fire from all natures of enemy weapons. On the following day the enemy attacks were intensified and again Brigadier Campbell was always in the forefront of the heaviest fighting, encouraging his troops, staging counter-attacks with his remaining tanks and personally controlling the fire of his guns On two occasions he himself manned a gun to replace casualties During the final enemy attack on the 22nd November he was wounded, but continued most actively in the fore-most positions, controlling the fire of batteries which inflicted heavy losses on enemy tanks at point blank range, and finally acted as loader to one of the guns himself. Throughout these two days his magnificent example and his utter disregard of personal danger were an inspiration to his men and to all who saw him. His brilliant leadership was the direct cause of the very heavy casualties inflicted on the enemy In spite of his wound he refused to be evacuated and remained with his command, where his outstanding bravery and consistent determination had a marked effect in maintaining the splendid fighting spirit of those under him. 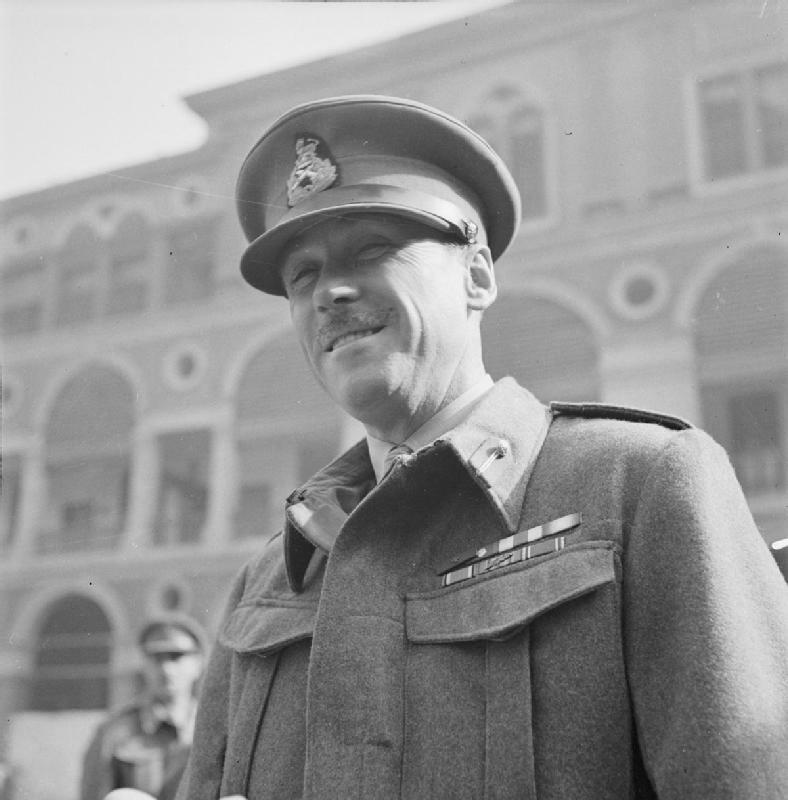 Jock Campbell rose to Major General and GOC 7th Armoured Division, but tragically died in a car accident at Halfaya Pass just a few weeks after taking over his new command, on 26 February 1942.